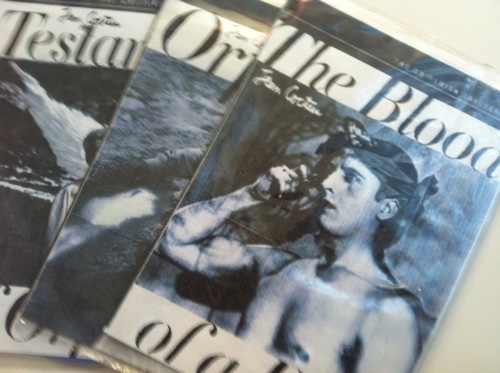 Around the corner from stacks of baby shoes, counterfeit Gucci wallets, and spangled iPhone cases, I got burned copies of Jean Cocteau's Orpheus trilogy at an outdoor market in Mexico City. A Sunday afternoon in Roma Norte, I was drinking coffee with new friends. The city was new to me and I had only arrived late the night before. We jumped in a cab and directed the driver to a market a little way outside the center of town. Miguel said he was going to pick up a copy of Pigsty there. I was confused at first, assuming it had to be something other than the 1969 Italian film, but indeed that was the one he meant. Seemed an implausible feat to find a physical copy of any Passolini movie, let alone a more obscure selection, anywhere without paying for shipping and waiting at least a week. But I didn't say anything then. "He's not going to find the Passolini film here," Manuel said, as we were wandering through Tepito's labyrinth of tents. It was mostly pirated goods: branded tennis shoes, video games, and handbags; but with some intention to the ordering of the inventory. Suppliers tended to specialize in certain items, one might carry only knock-offs of a single particular designer label, another sold only anime DVDs. Tepito sometimes functions as a wholesaler for vendors who operate smaller streetside sales. We walked through the section that was largely physical media for sale— Blue-ray, DVD, and CDs with covers varying from identical to the original to very handmade-looking inkjet prints. I was told that sometimes you could see vendors burning these disks in the back of the tents. Have you enjoyed an article Rhizome published recently? Have you saved any of our features on Instapaper or emailed a story to your friends? Is there something you first saw on this website that inspired you or made you consider things in a new way? I invite you to consider making a donation to Rhizome. Your donation allows us to continue our editorial operations and maintain our independent voice. Rachel Wetzler considers how we might think of Cindy Sherman’s photography now that she uses Photoshop in her practice. 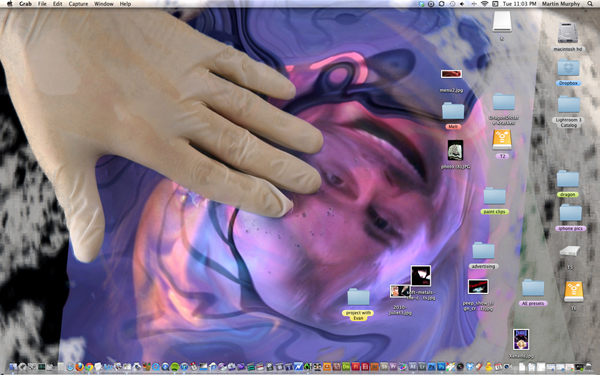 Using Adam Cruces’ Desktop Views (a response to Alexei Shulgin’s Desktop Is,) as a jumping off point, Jason Huff explores the history of desktop aesthetics. As publishing moves from the page to the screen, Orit Gat considers the unique role of the digital image. She later spoke about this essay on a panel at the Frieze Art Fair. Yin Ho speaks with the creator of the Guggenheim Museum’s first digital project, 14 years after its launch. A personal essay by artist John Powers on public space and its political implications. An essay from The Piracy Project, an international publishing and exhibition project, on the mutability of text in both physical and digital books. 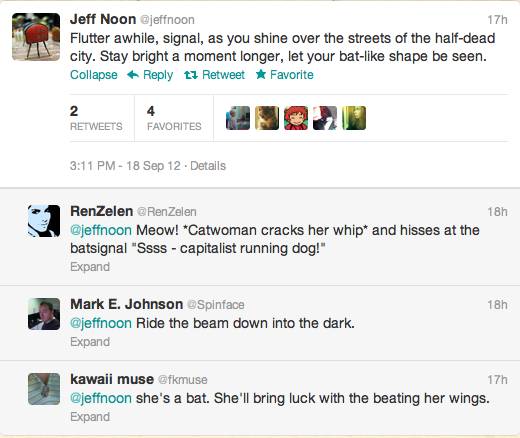 Jeff Noon's tweets are reliably among of the best contemporary fiction works today —beautiful stories told over short bursts, each under 140 characters. He calls the stories "microspores" and fans have submitted art and music to a tumblr collection. Wedged in between Romney quips, #FFs, and everyday social media-ing, the economy of his words as well as the context makes them all the more satisfying; like momentarily fading out of a conversation to recall last night's dream. Last night, Noon, the author of several novels, (Vurt, Falling Out of Cars, the recently released Channel Sk1n, among others), had an especially frenized twitter feed — posting 50 stories at once and retweeting fiction responses. 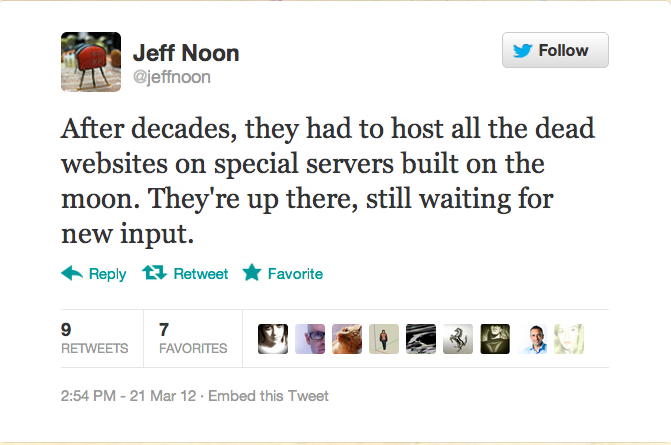 The "Sporecast" was so active, Twitter throttled his account multiple times that evening. 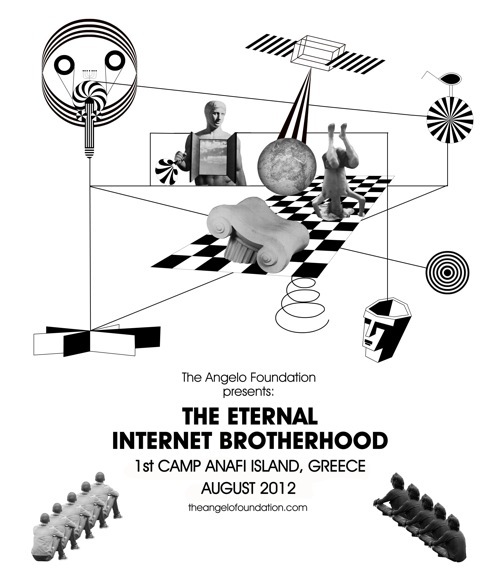 What was the inspiration for the Eternal Internet Brotherhood? I was always inspired by various alternative and autonomous communities getting together to push the limits of creativity. In our days the internet is a place where new realities are taking form and I believe is not only "embodied" through our screens anymore. The Eternal Internet Brotherhood is an experiment of how these realities continue to extend after/beyond the limits of the web, a shelter from the visual provincialism of technology within which we now live. The interface we use for this spiritual and creative journey is the mystical island of Anafi in Greece, the place which ancient god Apollo "teleported" as a shelter for the Argonauts.